Solidarity offers Signature loans and Personal Lines of Credit with credit limits up to $10,000 and rates as low as 8% APR. Your personal loan can be used for any reason. Payroll deduction can be used for easy payments. Signature loans may be repaid during a period up to 48 months. Payments for Personal Lines of Credit are calculated at 3% per month of the outstanding balance. A personal loan does not require you to use an asset as collateral guaranteeing the repayment of the loan. Call (765)453-4020 to apply or get more information. Interest rates may vary with credit score and credit limits up to $10,000 are based on total income. 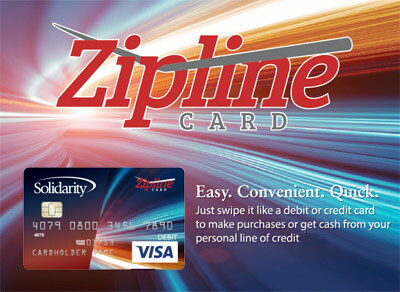 Call (765) 453 4020, extension 1304 or email us at loandesk@solfcu.org to order your Zipline card today.